How effective is vedolizumab (VED) for induction and maintenance of remission in patients with moderate–severe ulcerative colitis (UC) who have previously failed other anti-TNFs? 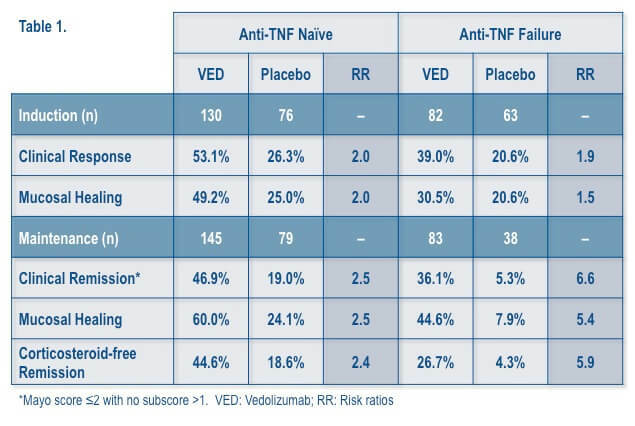 As with all other biologics, there is a slight decrease in the efficacy of VED if the patient has been previously treated with an anti-TNF. The parent study, GEMINI I, assessed the efficacy of VED for induction (weeks 0–6) and maintenance (weeks 6–52) of remission in 374 patients with moderate–severe UC. The two treatment arms differed by VED dosing frequency, either every 4 weeks or 8 weeks. Since the efficacy outcomes were similar, the VED treatment groups were combined in this post hoc analysis. Patients included in this analysis were first categorized by study group (VED vs. placebo) then by prior anti-TNF exposure (naïve vs. failure). Results were expressed as risk ratios (RR) for efficacy. For both induction and maintenance, VED was superior to placebo in all patients (Table 1). Specifically, for induction of remission, VED therapy was similarly effective for patients with and without prior anti-TNF exposure. During maintenance, anti-TNF naïve patients had higher response rates to both VED and placebo than those who had previous anti-TNF failure. The anti-TNF failure patients, had much higher RRs for clinical remission, mucosal healing, and corticosteroid-free remission than their anti-TNF naïve counterparts. The authors noted that this merits further investigation as this population was characterized as having refractory disease and may have been primed to respond to VED in the long-term rather than placebo.